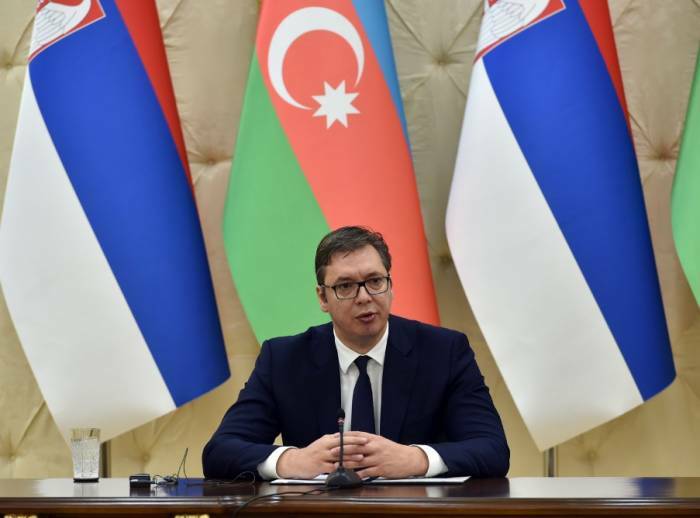 "Serbia supports the sovereignty of Azerbaijan", said Serbian President Aleksandar Vucic. Serbian President made the remarks at an expanded meeting with Azerbaijani President Ilham Aliyev in Baku on May 21. President Vucic firstly congratulated President Ilham Aliyev on his victory in the presidential election and wished the Azerbaijani people prosperity. The Serbian leader also extended his congratulations to President Aliyev on the occasion of the centenary of the Azerbaijan Democratic Republic. “I express my gratitude for giving support to the independence and sovereignty of Serbia. We also support the independence and sovereignty of Azerbaijan. The two countries will not change their stances. In Baku, we feel like at home of our closest friends. Mr. President, I attach special attention to your activity. You make great efforts to maintain the sovereignty and independence of your country and seek the country’s prosperity in very tense conditions. In addition, you have established good relations with other countries. Serbia attaches great importance to you policy and respects it. I believe that there is still much to be done", Aleksandar Vucic added.